Home / Other items. 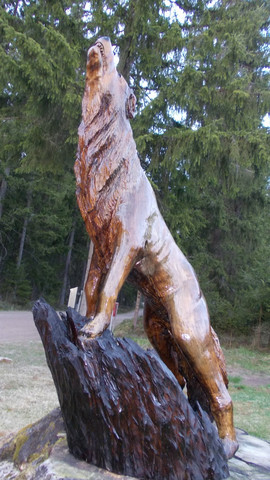 / Wooden statue, Finnish Wolf. Remarkably fine handcraft. Carved from a single log of 5 year dried Finnish birch, finished with genuine pine tar, anti-mold agent and final gloss is from gun stock oil. It takes approximately 3 weeks to carve such item + 2...5 years wait for the wood to dry out. The original log had diameter of 90cm and weight of 600kg, lot of the mass is shaved off in the carving process. "Only" 120-200 kg is remaining. Item can be shipped to anywhere on this planet, the shipping outside finland will cost anything between 100...2000€ and buyer has to ask if there is any biosafety regulations of wood imports from Finland for birch. If you are willing to pick up the item, it can be arranged, the statue is in Luumäki county in eastern Finland our local agent has a place for the item.